It’s to the Finals for the Bruins, baybeeeeeeeee! 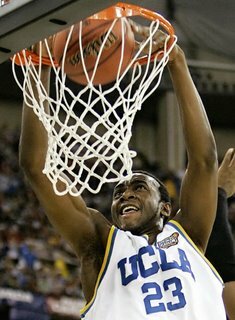 I can’t believe how much time has passed since those days but watching the excitement of today’s game, I was instantly transported back to that exciting NCAA tournament and how proud I was then (and still am) to be a Bruin. This Bruin team really earned my respect today with how hard they played. And I still can’t get over how talented Luc Richard Mbah a Moute (umbah-a-moo-teh) is. How is it possible that this guy is a freshman who has only been playing 5 years of organized basketball? Amazing. I’ll be cheering him and the rest of the UCLA team on Monday night. 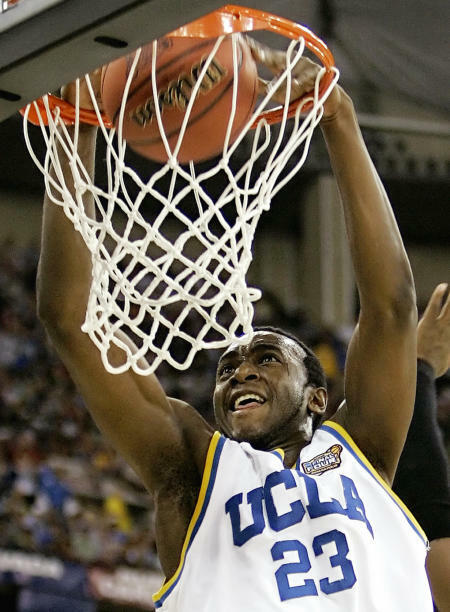 INDIANAPOLIS (AP) – The UCLA defense had blocked his final shot and he had committed his final foul. Wearily, Glen Davis plopped down on the bench and shook his head. Oh, Baby, can the Bruins play defense. Throw some offense in there on the same night and not even LSU and its 6-foot-9, 310-pound star, the guy known as “Big Baby,” had a chance. The Bruins shut Davis down Saturday en route to a 59-45 victory over the Tigers that put them one win away from their 12th national title. “They came out and punched us and we didn’t recover from it,” Davis said. The jozjozjoz.com archives for Sunday, April 2nd, 2006.